The Lure enchantment seems to have changed and now level 5 is the max rather than 8. Super Rods will be changed to 5, but they still seem to be the same speed as before. Shiny Rods from TH have been lowered from 4 to 3, but any that you already have on 4 will remain on 4. Hopefully all fish are still catchable and I haven't missed anything. How about pets, disguises and an ender bow? lol bringing back the old enderbow idea from the grave aye.. Increased the cap for infusions on an item. Default cap is 1000. At lvl 50 you can have 2000, at lvl 70 you can have 5000 and at lvl 99 the cap is 10,000. Remember that even if an item has reached the cap, you will still get XP from infusing it, the emeralds will just be consumed and not stored in the item. Available only from premium TH keys. When you reach level 105 in a skill you will unlock a trail effect. There is a trail for each skill. Will we see them somewhere? I'd love to see what im working towards! Ask someone who has one, like Jay. It's just a colour change for each skill. They require level 100 in a skill to wear. A full set costs $400k. They pulse colours to show off your level 100. The colour change will look slow for yourself but it is smooth for others. 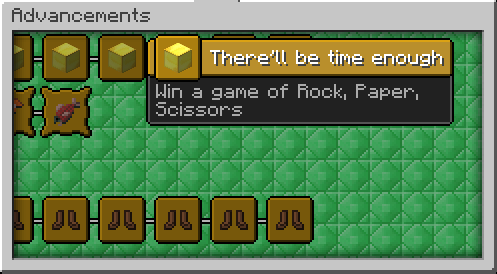 Double XP books will now add the time on to your current time rather than overwrite it. Level 90+ infusion will allow the use of emerald blocks. This makes training 9x faster. Infusion level caps for admins have been adjusted. To level beyond 105, all other skills must be at least 100, this was already the case, but I added that to level beyond 110 you must have 105 in all others, beyond 115 you need 110 in all others, and beyond 120 you need 120 in all others. 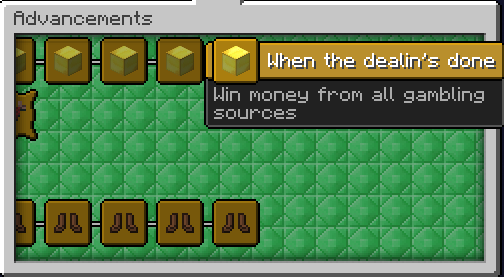 Custom Acid Mines advancements won't be achievable for a little while after 1.12, but I am working on them. This made me so happy, this is great. Advancements are all messed up in 1.12. They don't load from the main world folder, they were previously in the creative world folder (took a while to figure out that's where they would load from) but now after creating a new world and removing the old spawn world, the advancements are trying to load from a different world folder (even though creative hasn't changed). So, while I didn't know that, the server loaded up without any custom advancements which for some reason meant it removed all data of them being unlocked for players. I found the right world folder for advancements to work again, but all progress on them has been reset. In 1.13 it will be better, advancements will always load from the same place. 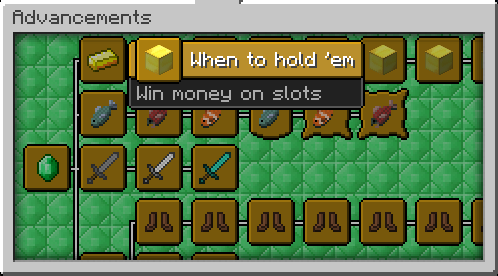 There may be some advancements that aren't unlocking atm, I'll wait until 1.13 before attempting to fix them. 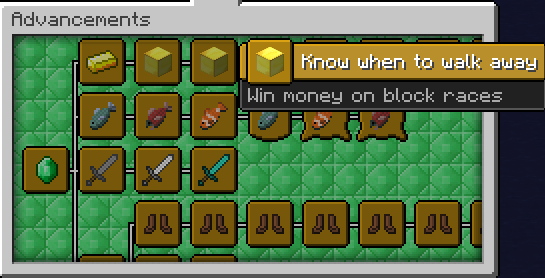 Having a fish box in your inventory makes all raw fish that you pick up (like from fishing) go into the box instead of your inventory. The box is a shulker box so it has a standard size limit, but you can carry multiple boxes. 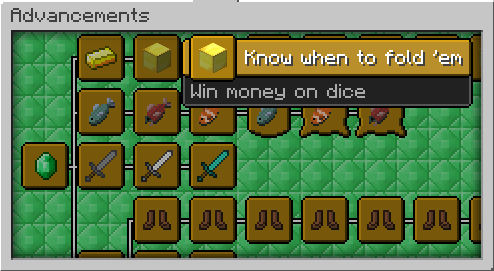 When they are full, crouch and right click a chest to dump all of the fish into the chest. Fish Box can be bought from the /rewards shop for 50RP. 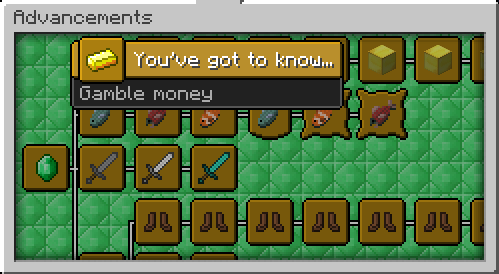 Toggles a notification of which fish you caught on the action bar. Helpful for when the fish go into the fish box. Level 100 now gives an extra 5% chance to catch a shiny fish, and every 10 levels after that gives another 5%. The standard chance is 3%, so at 100 you will get an 8% chance. Using a rod with shiny boost gives 8%, so with that at level 100 you will have a 13% chance. During a super double XP weekend when the rates are doubled, that would be a 26% chance. Level 150 (probably impossible to achieve) would give a 76% chance during super xp with a shiny rod. 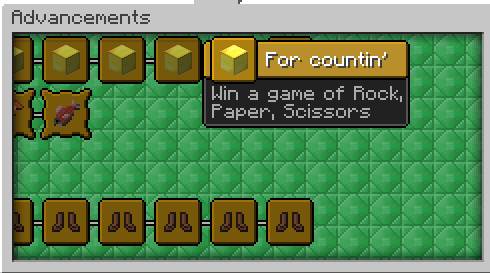 I'm making a few small games that are played in a chest interface. They will be used to get Easter items but will be playable after Easter as well. I didn't send that newsletter, it was automatic, and all of the topics are old.